William T. Trego | Catalogue Raisonné | Study for "Horse Artillery...Skirmish Before Petersburg"
Study for "Horse Artillery...Skirmish Before Petersburg"
Courtesy of John W. Eichleay, Jr. Signed and dated, lr: "Wm. T. Trego 1865 [sic]"
The absurdly incorrect date on this painting was not painted by Trego, but was most likely added by art dealer, Harry O. Eichleay of Pittsburgh, Pennsylvania, who owned the work early in its provenance, more than fifty years ago. He was known to have altered paintings that passed through his collections. The painting is a study for a work Trego did for George Barrie, Horse Artillery, 1865. Going into Battery: Skirmish before Petersburg. 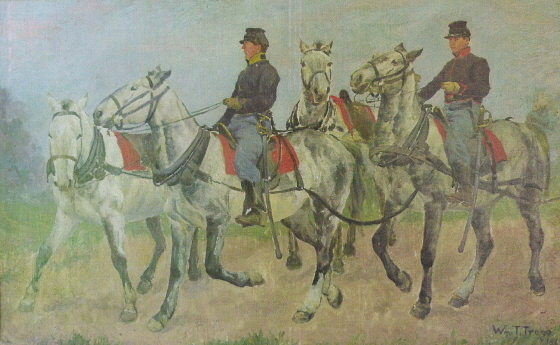 The same horses and men can be glimpsed in the far right background of the Barrie painting, beween the officer with the upraised saber and a mounted bugler. Part of the group is obscured by the figures in front of it, and the horse on the far left of this composition has been altered in the final version. It serves as another example of the methodical and painstaking approach Trego took when planning his paintings. Owned by Pittsburgh art dealer, Harry O. Eichleay as early as the mid 1960s at which time Eichleay gave the work to his nephew's wife, who ultimately passed the work to her son, the current owner.